I'm looking at this empty comment section and can only think "pictures taken moments before disaster"
@Richard Cypher, yea, but we always have newcomers, and they guys that love to stir the pot for the same old arguements. @ThePandaPool , and heeeeeeere we goooooo. @farkleberry dumbbell, I just read down the line a little bit. Oh boy is some of it good. Davrial goes on a good tangent. @ThePandaPool , I do enjoy stirring pots and pushing buttons. @ThePandaPool , *looks at all 51 comments* yup, you predicted correctly. Call me crazy, but I'm pretty sure they make up the majority of the prison population because they commit the majority of the crimes that have you sent there. 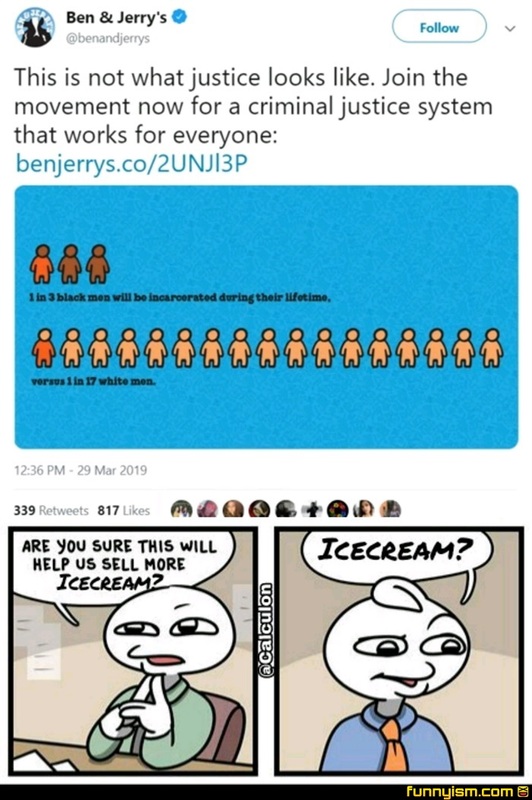 But who knows, maybe selling them ice cream will solve that social issue? Can't commit crime while enjoying a bowl of ice cream after all. @ JCLEMZ, shhhhh dont use logic! @Silver6456, There's no such thing as a law that "targets" a race specifically. Such a law has been illegal since 1964 and would/should be knocked out of existence. If blacks are more prone to, say, do or distribute illegal drugs and end up in jail because of it, then that's a different topic. That's a societal issue and a perfectly needed conversation on drug policy in this country. I've never been a fan of "drug laws target minorities" as an argument because I've known plenty of white people to go down for drugs. @ JCLEMZ, I do agree with you, but what is your take on making something illegal because a certain group does it more often than others due to cultural reasons? That's the premise behind why pot was made illegal in the first place. @ThePandaPool , pot being illegal is idiotic on multiple levels. Alcohol has better reason to be outlawed than weed (not that I’m advocating for prohibition). As for laws being passed purely because of racist motivations, the answer for that is to hold corrupt politicians responsible. @ThePandaPool , no pot was made illegal for the paper industry.... William randall Hurst I believe wad the name of the paper mogul who started the propaganda against hemp..
@Craiger, common misconception. Not the case. @Silver6456, and at what point do we actually address the present instead of the past? The past doesn’t change, and Nixon hasn’t been the President for a quarter of a century. Bringing a case against legislation that isn’t active anymore isn’t going to make change. @Silver6456, I agree. Any system that awards drug possession with sentences as long as or longer than that of second degree murder is a system with messed up priorities. There’s way too many people people serving 10+ years for nonviolent drug offences. I'm down for social change, but when effect is directly related to cause, the justice system isn't the social aspect that needs change. I think it’s cool when corporations speak on social issues in a serious tone when there is no real upside. @Korywitak, yes i to love it when my icecream company moralizes to me about how bad of a person i am. @BlazingBowman, they made a statement about disproportionate incarceration rates, how did you take that as a personal attack? @BlazingBowman, if that makes you feel bad, you probably deserve to. @K1l, did i say it was this comment that was moralizing to me about how im a bad person? @Korywitak, yes because im a judge and therefore share in the responsibility of incarcerating all those innocent black people who didnt do nuffin. @K1l, because the disproportionate incarceration rate is directly tied to a disproportionate crime rate, and yet no SJW will acknowledge that because it goes against the narrative. @I Are Lebo, honestly there is no such thing as a disproportionate incarnation rate. People choose to do things that get them incarcerated, we dont choose who does. @I Are Lebo, no shjt it’s due to disproportionate crime rate, which is directly tied to poverty rate, which is the issue at hand. Disproportionate incarceration rate is just the end result of those issues, so that’s what’s brought up and the rest can be traced back. Pulling out the “sjw” card is useless because nobody here is an sjw. @Available Username, the disproportionate thing I’m referring to is the vastly higher percentage of black convicts than white. It’s for a whole host of reasons, though. A big one is low income offenders being pressured into accepting plea bargains. @K1l, I don’t know if I’d say no one on this app is an SJW, but I agree no one on this thread seems to be. While I sympathize for people in impoverished areas being more likely to commit crime out of desperation or hopelessness, it doesn’t excuse or justify it. Being destitute doesn’t excuse robbing others, or taking out your anger on others in the form of violence. @I Are Lebo, Nobody is saying their actions are justified at all. That’s not the conversation here. The point is that minorities (specifically black Americans) have very disproportionate crime and poverty rates, which are the remaining consequences of the American Jim Crow laws and the such that ended less than a century ago. This is the issue that’s being addressed. But just because there aren’t any current laws in place that still discriminate against minorities, it doesnt mean impact of racism is gone. Nobody is justifying the actions of black crime, but rather discussing ways to alleviate the current issues caused by the racist systems America had not too long ago. @K1l, except that’s not true. People ARE justifying it when they bring up the high poverty rates when the topic of discussion is the rate of incarceration. Jim Crow laws had a massively negative impact on the black communities, but what’s screwing them now is the lack of marriage, the absent fathers, and a culture that disincentivizes a passion for education, as well as blatant disregard for the law. Until those issues get addressed, nothing is going to get better for black Americans. The #1 oppressor of black Americans in 2019 are other black Americans. The black-on-black crime, the abusive single mothers, the deadbeat dads (many of whom are convicted felons), and the victim complexes will keep them in turmoil for ever unless they as communities rise above it. No outsider can do that for them, no matter what colour the outsiders are. @I Are Lebo, where do you think those issues came from? All the issues you just described are symptoms of poverty. Yes, those are all problems that can and should be addressed individually, but they all stem from the same general thing. Why exactly do you think in comparison to whites, blacks have such a disproportionate poverty rate? It doesnt take a rocket scientist to draw the conclusion that it’s directly linked to the hundreds of years of systemic oppression that only officially ended 60 or so years ago. Black communities still face so many issues because the government did such a shjtty job of compensating these communities. Sure, they werent legally oppressed anymore, but their jumping off point was very low. The details on how exactly to go about this can be debated all day, but along with change within itself, the issue will never be solved without some sort of aid. Otherwise, a disproportionate amount of black americans will continue to be in poverty for a very long time. @K1l, do you have any evidence that supports that claim or are you just assuming. @BlazingBowman, the evidence is that oppression and segregation laws against black people were in effect for hundreds of years and only ended within the last century. A systematic oppression of a particular group of people that focused on poor education and wealth is going to have lasting effects on the group of people even after it’s legally terminated. It’s not a coincidence that what was once the most legally oppressed group of people in a nation ends up being the group with the highest poverty rate. It’s pretty basic American history and economics. But im sure you can find plenty of studies linking legal oppression and poverty, but you really shouldn’t need to. It’s extremely clear. @K1l, so no. I guess the barrier for entry here is quality of life slowly rising. @K1l, looked at a labour bureau statistic ( or so it says i litterally clicked on the first link that didnt look like a lefty propaganda site and looked more official.) So what i could gather in the last 10 minutes from the most cursory research imaginable. Is that black people are up in middle to upper classes and down in poverty and working class. Which would lend credit to your theory in my oppinion but doesnt prove it. @K1l, you’re completely wrong. Every other subjugated demographic eventually moved forwards. My grandparents survived the Holocaust and spent decades making their way to Canada. They worked the rest of their lives providing for their families during a time where most businesses wouldn’t hire Jews and most landlords wouldn’t rent to them. The fatherlessness and lack of discipline causes the poverty, not the other way around. That’s why there are so many successful black people in the USA. They’re the ones that worked for it. You can’t give success to people. They have to earn it or it’s valueless. @K1l, you’re conflating how they got poor with why they stay poor. It’s actually the same logical failing as what keeps the wage gap myth alive. You’re completely discounting personal agency. @Davrial, there’s no such thing as “actual social justice.” There’s justice, and there’s injustice. Any time you put a word in front of justice, it becomes the latter. Also, I super don’t need ice cream companies trying to teach me their version of morality. @RepostSniper, as if someone of your ilk would have read a rebuttal anyway. People like you don't listen to polite reason, so I don't waste politeness. Besides, you just admitted you didn't even read my argument. Could have done so and insulted me right back or held your ground, but can't even bother with that can you? Probably too much reading for you anyway Mr "there's only justice and injustice"
@Davrial, once you go into ad hominem, the rest of your argument has 0 credibility. Sorry if I offended you by saving myself the time to read your 5 paragraph essay of nasty comments. Have a good day; try not to get so triggered. @Davrial, social justice is antithetical to actual justice. It’s not a subset. Especially when intersectionality gets involved. @RepostSniper, I think not reading someone points and arguement would make you even worse. Refusing to listen because someone may be hot-headed is pretty stupid, and admitting to not even reading his rebuttal discredits you a lot more than calling you an idiot. It's also important to note he isn't throwing random names at you. They're true. You're dumber than sh!t. @RepostSniper, Nice fallacy fallacy there, mate. @Invalid User, I totally agree that hearing someone out and engaging in fair debate is critical. But I’ll be damned before I waste time reading insults from Joe Shmoe on the Internet. I feel obligated to read counter arguments. I’m not obligated to read ad hominem attacks. Not sure how that makes me dumber than shït or a dimwit, but ok.
@Jdrawer, calling someone a dimwit in the very first sentence of your rebuttal is a perfect example of an ad hominem logical fallacy, mate. @RepostSniper, And using the fact that he used an ad hominem as an argument that his ENTIRE (in all caps to show encapsulation) argument was faulty is a perfect example of a fallacy fallacy, mate. @Jdrawer, when someone opens with name calling, it’s only gonna go down hill from there. My options were take the cop out “victory” or spend the rest of the day in a name calling pïssing contest with him. I’ll take the former every time when it comes to randos on the Internet. ... mate. @RepostSniper, It should be noted that, Internet or not, discussion isn't about not getting worked up. Coolness is not a necessary condition for good conversation. @RepostSniper, and I'm talking about jdrawer. Hes just a piece of garbage. @Jdrawer, you giving advice on proper internet behaviour is like Donald Trump giving a lecture on respectful tweets. Why don’t you follow your own advice and try NOT to be a massively hypocritical internet troll?